Dinosaurs are everywhere this summer and after a visit to your Natural History Museum your kids will be stoked to learn more about dinosaurs and play with their toys. You can build your own dinosaur dig at home by just taking some dinosaur toys, a plastic container a some kid-friendly utensils. You simply drop the dinosaurs into the plastic container filled with water and freeze it. Then flip it upside down and you’ll have a block of ice with dinosaurs frozen inside. You can use warm water to thaw the ice if your little ones are too impatient. 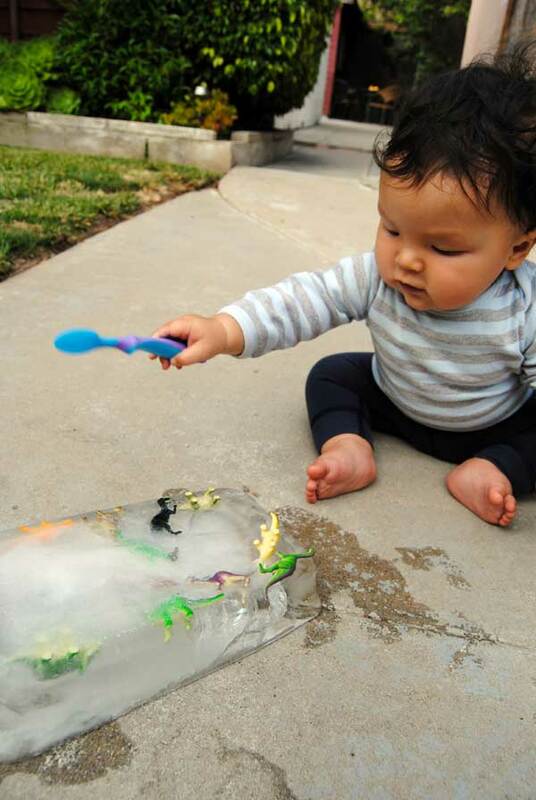 Our son isn’t too young to enjoy playing with the block of ice but the small dinosaur toys are a bit too small for him to play with but he enjoyed banging his spoon against the ice and clawing at the dinosaurs. Here are some more step-by-step photos and it’s the perfect way to keep your kids cool on a summer afternoon. This project was inspired by the Naughty Secretary Club – Thanks!